Electrophysiology Market size was valued at USD 4.2 billion in 2017 and is expected to witness growth of over 6.1% CAGR from 2018 to 2024. Growing incidence of cardiovascular diseases (CVD) owing to global burden of geriatric population and other risk factors will stimulate electrophysiology (EP) market growth. Elderly people are susceptible to suffer from various kinds of cardiac arrhythmias. According to the European Cardiovascular Disease Statistics 2017, cardiovascular diseases account for over 45% deaths in Europe. Electrophysiology offers better mapping and treatment for such conditions; hence increasing incidences of CVD will boost the demand for electrophysiology devices in coming years. Technological advancements will offer attractive growth opportunities in the upcoming period. Advancements in electrophysiology ablation and diagnostic catheters offer better treatment of arrhythmias through superior imaging as compared to conventional devices. For instance, Intellanav ST by Boston Scientific is a navigation-enabled small-tip catheter that enhances ablation. Such advancements that enable precise ablation and mapping will accelerate the device demand. Additionally, rising preference of electrophysiology catheter ablation is estimated to majorly drive electrophysiology business growth. EP catheter ablation device yields high procedural success rate and efficacy that will impel the electrophysiology industry growth over the projection period. However, lack of skilled experts coupled with usage of reprocessed devices in emerging nations is forecasted to potentially limit the market growth in coming years. Electrophysiology ablation catheters market segment held 48.2% revenue share in 2017. High market share is attributable to rising demand for ablation catheters owing to safe and effective treatment of atrial fibrillation. The success rate of ablation catheters is around 75-85%. 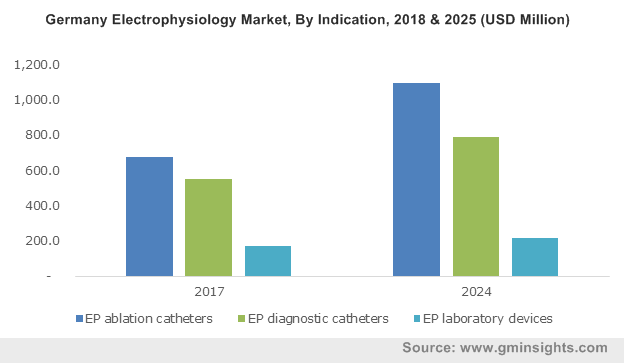 Furthermore, firms are emphasizing on new product development and are heavily investing in electrophysiology devices, that will assist electrophysiology ablation catheters market growth over the foreseeable future. EP diagnostic catheters market segment will grow at 5.4% CAGR over the forecast timeframe. Diagnostic catheters offer dimensional flexibility depending upon the location of cardiac tissue. EP cardiac mapping provides geometrical information to the electrophysiologist that simplifies the ablation procedure. Diagnostic catheters are used in combination with ablation catheters that will further impel its usage. In addition, technological advancements in EP diagnostic catheters leading to elimination of irrelevant data points will boost adoption rate of the product in forthcoming years. Atrial fibrillation indication market segment was valued at USD 3,171.9 million in 2017. Escalating prevalence of the disease indication will significantly contribute to increase in segmental size over the coming years. Alcoholism, binge eating, faltered lifestyle along with aging population form the considerable risk factors leading to atrial fibrillation globally. The International Journal of Clinical Practice stated that the prevalence of atrial fibrillation recently was between 1-4% across Australia, U.S. and Europe. Development of innovative products for treating increasing atrial fibrillation cases will increase application of electrophysiology devices for atrial fibrillation over the projected period. Atrial tachycardia indication segment will foresee lucrative growth of 8.5% CAGR during the forecast timeframe. Growing prevalence of atrial tachycardia and atrioventricular nodal re-entry tachycardia should boost the market growth. Electrophysiology allows efficient diagnosis of atrial tachycardia. Moreover, technological advancements of electrophysiology devices resulting into increased sensitivity for identification of cardiac arrhythmias will positively impact segmental growth. U.S. market accounted for 32% market share in 2017 and will witness significant growth during projection period. Electrophysiology devices is broadly used to treat tachycardia, atrial fibrillation and other CVDs. Adoption of high-end technological products by American electrophysiologists along with availability of skilled professionals will assist market growth. Furthermore, accelerating pervasiveness of CVDs, sophisticated healthcare infrastructure coupled with high healthcare spending will further flourish U.S. electrophysiology industry growth. Germany market will grow at fast pace of 5.9% CAGR during the projection timeframe. Increasing number of women suffering from arrhythmias is forecasted to escalate the adoption rate of catheter ablation procedures in Germany. Rising research and development activities to explore variations in atria across research centres will favor advancement of electrophysiology devices. Thus, growing demand for technologically advanced imaging and ablation devices should drive German electrophysiology market growth over the coming years. 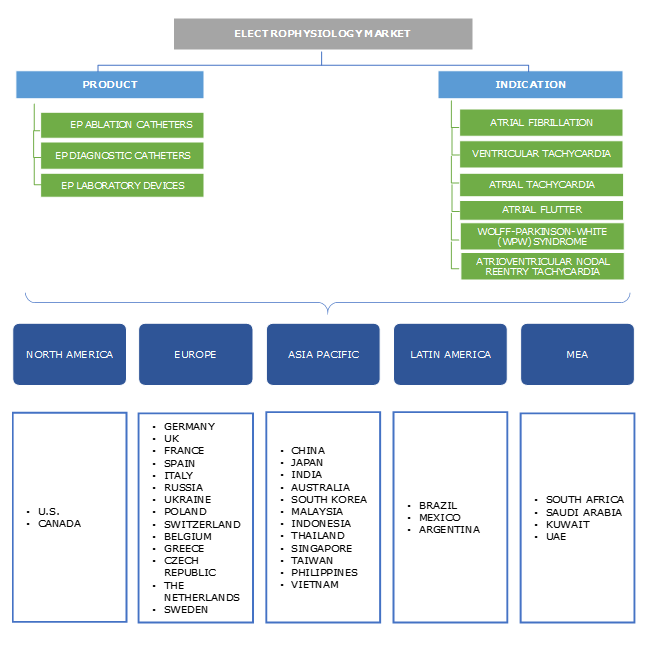 Major industry players operating in electrophysiology market are Abbott laboratories, Boston Scientific Corporation, Johnson & Johnson, Medtronic and Siemens AG among the other players. Companies are focusing on novel product launch and acquisitions to attract higher profits in electrophysiology market. For instance, in June 2018, Philips Healthcare singed an agreement for acquisition of EPD Solutions. The acquisition will fortify Philips’ electrophysiology product line, thereby increasing revenue. Fluoroscopy was adopted in earlier years to locate cardiac arrhythmia while performing cardiac ablation. The first catheter-based imaging device was used in 1950s-1970s. Subsequent developments in catheter ablation were made during late 1980s. Advancement of catheter ablation as well as mapping system in a single device led to industry growth. In addition, Rhythmia Mapping System by Boston Scientific Corporation in 2012-13 became the high-definition mapping system that was cleared in the U.S. and Europe. Similarly, technological advancements coupled with increasing incidence of cardiovascular devices will spur electrophysiology industry in the forthcoming years.